Something intoxicating happened on a July morning in 1897. A steamship known as The Excelsior unloaded its first batch of successful Yukon prospectors onto a San Francisco dock. They dragged baggage behind them, loaded to the gills with gold. Gold dust. Gold nuggets. Gold bars. Word spread quickly and when the ship prepared for its return trip to the Klondike, agents were overwhelmed by a demand for tickets that exceeded the ship’s capacity by over ten times. Is it any wonder that a whisper of prosperity in a far away place could start a two year stampede to parts unknown? The late 1890’s brought with it a period of economic depression that swept the whole of North America. Gold was scarce. Many people struggled to attain the necessities of life. The Klondike and the dream of gold offered an escape from their despair. Spreading rumours of gold drove throngs of men and women abandoned their homes, surrendered their jobs, and left behind their families. 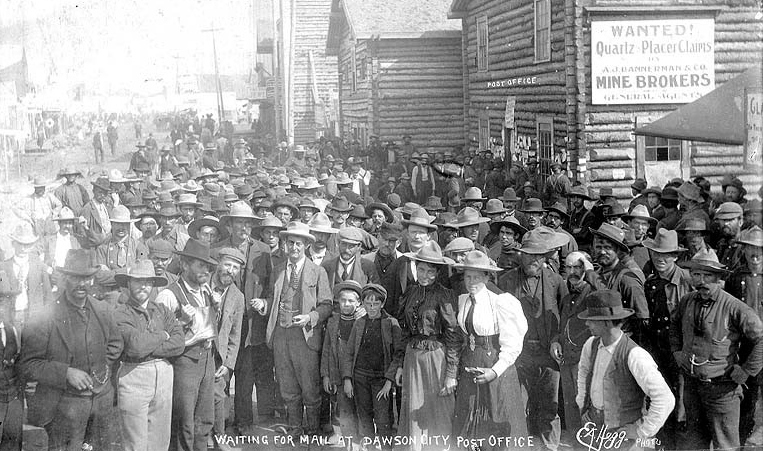 They rushed to port cities like San Francisco, Portland, Seattle and Victoria, in hopes of gaining passage on some vessel headed to Dawson City in the Yukon Territory. Memento photographs were fashionable parting gifts for loved ones. Prospectors posed, individually or with travel mates, in front of painted backgrounds featuring Yukon scenes. They dressed in newly acquired mackinaws and held props like rifles, snowshoes or fiddles. Subjects reclined on bearskins and fake snow. One can’t help but wonder how reality matched the fantasy of their adventure. The first perils of the journey began here at home. Many of these tenderfoots fell prey to unscrupulous businesses and empty promises. One promoter promised a reindeer mail delivery service similar to the pony express. Suave salesmen oiled the dreams with products to guarantee success for the soon-t0-be-rich. Pierre Berton’s The Klondike Quest lists “coffee lozenges, evaporated eggs, desiccated onions, beef blocks, peanut meal, saccharine and pemmican; and on the less practical devices: mechanical gold pans, nugget-in-the-slot machines, patented gold rockers, collapsible beds, knockdown boats, portable cabins, scurvy cures, even x-ray machines designed to detect the presence of the golden treasure hidden in the dross.” Manufactured goods — soup cans and glasses — were stamped with “Klondike” and flew off the shelves. These items must have littered the Chilkoot Pass, Skagway and White Pass as people cast items off to lighten their loads. 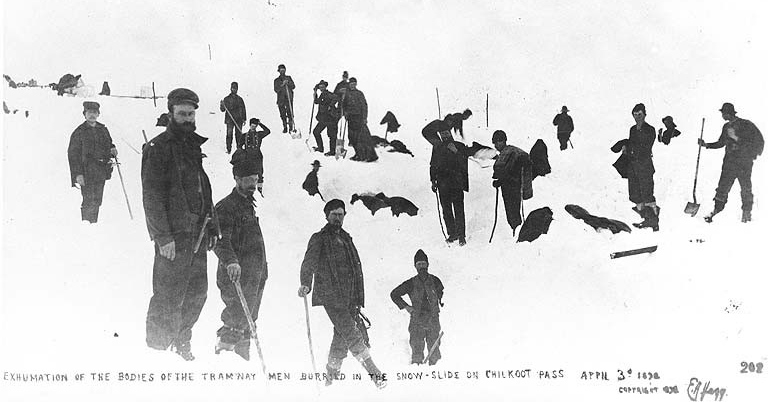 Roughly one hundred thousand people from North America and overseas ventured to the Klondike. The high volume of people and goods streaming through, caused the port towns to balloon to near impossible capacity. City infrastructures were pushed to the limit. On the wharfs, people waited with ten foot stacks of supplies. Prospectors needed sufficient supplies to cover their needs for one year. They boarded ships of questionable construct to transport them and their wares — dangerously overloaded. Men often slept ten to a cabin in rough hewn bunks. Some who ventured to sleep on the deck were swept overboard during storms. Even animals, dogs and horses, suffered injury in their crates and died en route. A few ships had to return to port shortly after departure, to redistribute the weight of their cargo lest they sink. For many, the dream became a nightmare before they reached their destination. How many would have set out for the Klondike if they were fully informed of the challenges that awaited beyond the end of the dock?